Human Rights Watch (HRW) has reported that the prosecutor’s written charges sheets against eleven activists, including Loujain al-Hathloul, Aziza al-Yousef, Eman al-Nafjan and Hatoon Al-Fassi, are outspokenly related to their campaigning for women’s human rights and the abolition of the male guardianship system. According to informed sources, these women have been accused of spreading information about women’s rights and the general human rights situation in Saudi Arabia “with journalists based in Saudi Arabia, diplomats, and international human rights organizations, including Human Rights Watch and Amnesty International, deeming such contacts a criminal offense.” Together with the aforementioned women, Mayaa al-Zahrani, Amal al-Harbi, Shadan al-Onezi, Nouf Abdulaziz, Saudi professors Abeer Namankani and Ruqayya al-Mohareb were on trial on 13 March. At the moment, the identity of the eleventh activist, a woman, is unknown. The day before the first trial, set on 13 March, the Saudi authorities had informed the families of the prisoners that the case had been transferred from the Specialized Criminal Court to the Criminal Court in Riyadh, an utterly irregular decision which aims at penalising the activists. Update: The second trial session took place on 26 March of 2019, the day after three of them, Iman al-Nafjan, Aziza al-Yousef and Ruqayyaa al-Mhareb were provisionally released. The rest of the activists were expected to be released later the 31st. 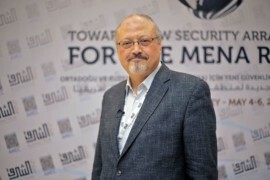 However, the third trial session, which occurred on 3 April 2019, did not lead to any conviction nor new release, as reported by Al-Jazeera. Iman al-Nafjan, Aziza al-Yousef and Ruqayya al-Mhareb announced that their fourth court appearance will be taking place after the month of Ramadan, at the beginning of June 2019. Verdicts concerning the other women activists were scheduled on 17 April 2019, but a Saudi Court postponed the fourth hearing without setting a new date. The European Centre for Democracy and Human Rights (ECDHR) strongly condemns the arbitrary detention of these women. We call upon the Saudi government to immediately release them and the other activists and political prisoners.